Sarah Martin Byrd. The Color of My Heart. Greenville, SC: Ambassador International, 2013. How well do we know our neighbors? How well do we even know our own family? Laura Carter loves her husband, Cam, and although she knows his father Monroe is a hard, racist man, she treats her father-in-law with respect. Laura accepts the fact that Cam, an accountant, has to help his father with his farm, and she does not object when Cam goes out at at night to assist his dad. Laura believes that she and Cam are a team, and that together they can weather any storm. Laura’s belief is put to the test in more ways than she could have imagined. Laura has always known that she was adopted. At her birthmother’s request, it was a closed adoption–Laura has never know anything about her birth family. 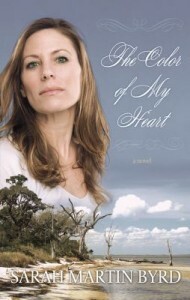 As The Color of My Heart opens, Laura’s birthmother, Nelda Brinson, is dying and Nelda’s grandmother makes the fateful decision to contact Laura. Nelda and her Me-Maw live so close by that Laura can visit them, and in doing so she finds out that her mother and her people are African Americans. As Laura, Cam, and their daughters are adjusting to that fact and getting to know their new family, their older daughter Larkin becomes pregnant. The baby’s father is her long-term boyfriend, a boy whose father is a good friend of Cam’s father and who shares his racist views. Sarah Martin Byrd weaves these three strands together in multi-generational story that contains history, horror, cruelty, compassion, and uplift. Christian Reid. A Question of Honor. New York: D. Appleton and Co., 1876. When her wealthy father dies, Mary Carlisle, who is blind, depends on her kinsman, Basil Severn, to manage her mills, stocks, land, and money. This works well until Arnold Devereux comes to Stansbury (thought to be Salisbury) to claim Mary Carlisle’s inheritance. When a court case goes against Devereux, he tries to gain Mary’s wealth by wooing her. Devereux is not the only person who is eyeing Mary’s wealth, and it takes loyal friends such as Basil and his sister, Madeleine, to see that her wealth is preserved. Love interests complicate matters for all the main characters. Buddy Strickland. Dreamweaver. Indian Trail, N.C.: Dreamweaver Publishing, 2006. This part-memoir, part-novel alternates the story of Buddy, a southern boy growing up in the 1940s, with a fictional recreation of the lives of Lea and Amos, Buddy’s Cherokee ancestors. Through the two stories readers can learn about the enslavement of Native Americans, mill village life, and mid-twentieth century Southern popular culture. John Hart. Down River. New York: Thomas Dunne Books/St. Martin’s Minotaur, 2007. The chance for easy money tempts both the haves and the have-nots in this novel set along the Yadkin River near Salisbury. When Adam Chase, acquitted of a local murder years before, comes back to Rowan County, he finds that suspicion of him has not faded. He also discovers that the duplicity that wrecked his past may wreck both his future and the lives of the people he loves. When Chase tries to renew his tattered relationships, he uncovers secrets that upend his understanding of his past and set a new cycle of violence in motion. John Hart. The King of Lies. New York: St. Martin’s, 2006. When Ezra Pickens is found murdered, there is no shortage of suspects in Salisbury, N.C. The wealthy but unpopular lawyer made a lot of enemies over his long career and it’s left to his son and partner, Jackson, to unravel the mystery.